The long awaited Propane Can Popper. This popper uses a standard US 14.1 ounce Propane or Mapp Gas cylinder to produce a repeatable, predictable Special Effects Fireball that dissipates in a few second and leaves no obnoxious residue. Please be aware that to purchase this popper, you must prove to us that you are a licensed, experienced, qualified Special Effects Pyrotechnician,. First in a series of 3 photos. 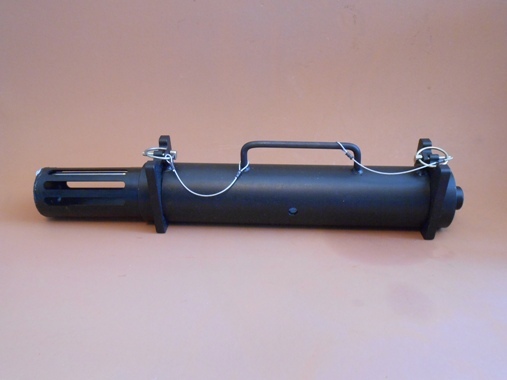 Single popper with Mapp Gas Cylinder. 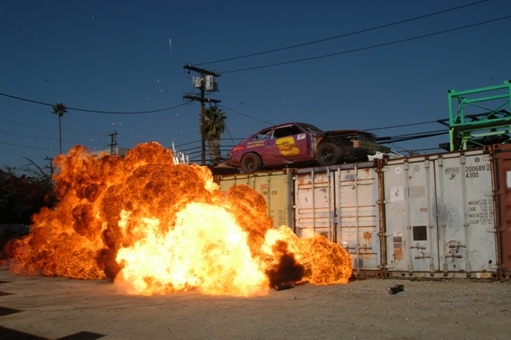 For scale, the containers behind are 8 feet high and 8 feet wide, giving an initial fireball of about 12 feet high and 16 feet wide. The second photo. Red flame with black smoke. Third Photo. 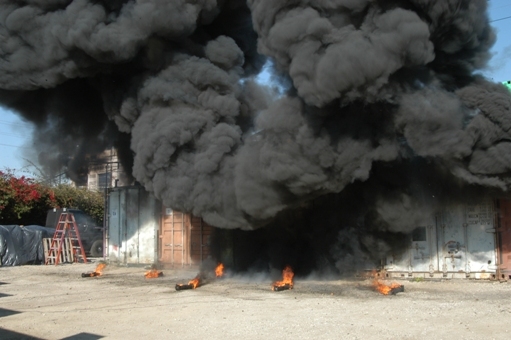 The fire begins to dissipate, and more black smoke. Here"s the first 2 already ignited. Now 4 of 6 are lit. Now all 6 are lit and produce an excellent long fireball effect. Now the black smoke cloud lifts off. Slight residual burn in the poppers.... the instant release of the propane freezes a small amount, which burns off in a minute. Nothing left except for a few drifting wisps of smoke. 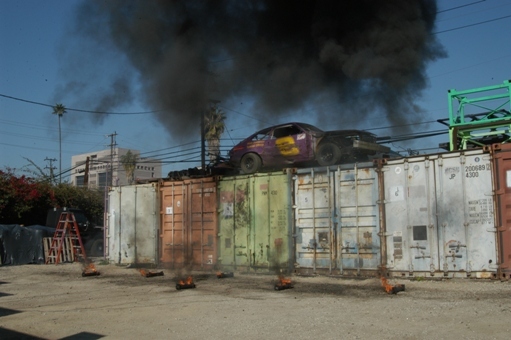 The doors of the containers were slightly warmed, and LuLu"s Pinto racecar on top of the containers was unharmed. 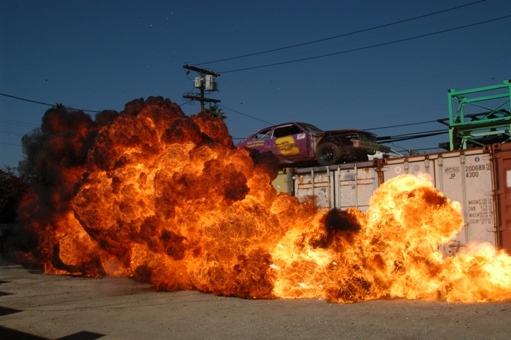 This test was done in our M2 zoned storage yard, two blocks from the Van Nuys City Hall, Police Station, and Fire station. There is an apartment building about 50 feet from the other end of the containers. 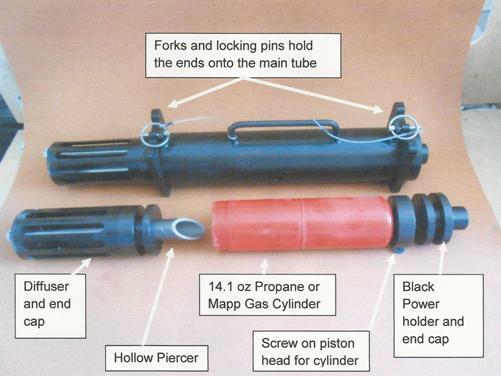 These poppers are relatively quiet; when they are actuated, the small amount of Black Powder just makes a low order bang. The Basic Components of the Popper. Laser cut, CNC machined, TIG welded, Black Oxide coated.